AAPG Annual Convention & Exhibition 2014 | Geoconferences (WA) Inc. I am grateful to the Geoconferences for the award of JH Lord Travel Grant, which helped to cover a part of expanses for the AAPG Annual Convention & Exhibition 2014 (6-9 April) in Houston, Texas. It was a great opportunity for me to be there and present part of my PhD project and network with other geoscience peoples from all over the world. It is one of the largest petroleum geoscience conferences with several dedicated themes for various research topics in the three days program. 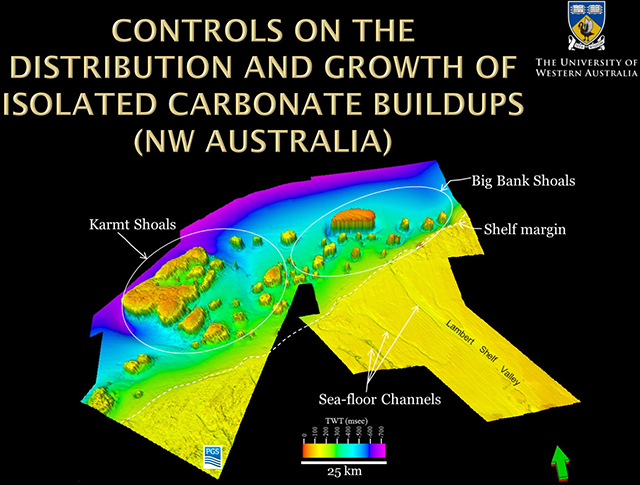 The title of my oral presentation was “Controls on the distribution and growth of Isolated Carbonate Buildups (ICBs), north west Australia” and it was categorized in the ‘Structural Control on Carbonates’ theme. sea level fluctuation, with relatively rapid rises and slow falls. In addition to that I attended presentations and visited posters by other researchers regarding recent advances in the field of petroleum geoscience. I met with some leading scientists and discussed various ideas. Moreover, I took a 2-days pre-conference workshop on ‘Sequence Stratigraphy’ and participated in a social event organized by Houston Geological Society. In brief, this was an excellent experience for me and thanks a lot to the JH Lord Travel Grants.